The spicy barbecue sauce is the perfect flavour complement to the charred tomatoes in this easy-to-make pasta dish. Mix 1/4 cup barbecue sauce and oil until blended; reserve for later use. Combine remaining barbecue sauce with garlic and pepper in large bowl. Add tomatoes; mix lightly. Grill tomatoes, cut sides down, 3 to 4 min. or until grill marked; turn. Grill 1 min. or until softened. Spoon into food processor; use pulsing action to process just until coarsely chopped. Place pasta in large bowl. Add tomatoes, basil and reserved barbecue sauce mixture; mix lightly. Serve topped with cheese. Garnish with fresh basil before serving. This pasta recipe is equally delicious whether served warm as directed or chilled. 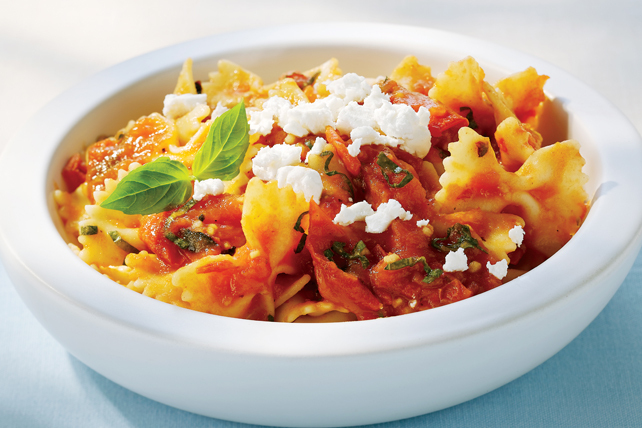 For best flavour, bring chilled pasta mixture to room temperature before serving. Substitute Cracker Barrel Crumbled Feta Cheese with Oregano, Sun Dried Tomatoes and Black Pepper for the goat cheese.